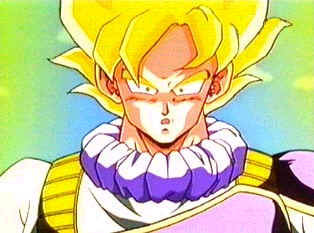 Super Saiyan is a very important word to many people out there who love saiyans! The first super saiyan was achieved by someone who went ape form, unfortunately, he wasn't able to control it and ended up destroying himself! Vegeta expected to be able to go super saiyan next, because he was of royal bloodline, but found he wasn't the next super saiyan, it was Goku! Brolli is/was the first true super saiyan. There are 4 (universally known) types of "super saiyan", each getting stronger and stronger. Super Saiyan - fulfilled when power level reaches a high limit, or when rage occurs over the death of a loved one. 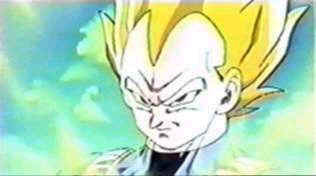 When this occurs, the saiyans hair turns yellow, spikes up, and their eye's turn green. The saiyan must be pure evil, or pure good. Ultra Super Saiyan - It's the next step up for super saiyan 1! Trunks achieved this level, it made him muscular and strong, but it slowed him down! Goku also achieved this level but he realized the flaw. They decided not to try this again. Brolli... was the only one able to control this stage of power... making him nearly indestructible. Super Saiyan 2 (sienen) - fulfilled when power level reaches a high limit, or when rage occurs over the death of a loved one. This stage is much more stronger than regular super saiyan. The saiyans hair is still yellow, but grows a few more strands and is pointed up more than Super saiyan. Gohan was the first to fulfill this level of super saiyan. Super Saiyan 3 - This is the next most powerful stage. Only Goku and Gotenks were able to achieve this level of super saiyan! The saiyans hair is pointed down because it's so heavy, and grows a few more feet!! This stage is truly powerful in my opinion! The draw back is that the saiyan does lose a lot of energy in this stage. Super Saiyan 4 - This is the most power stage of saiyans. (besides golden oozaru) The saiyan gets their tail back, and doesn't have yellow hair at all on their body! Their bodies are covered with red fur, besides the chest, and they get dark red lines under their eyes. They almost look evil! Goku and Vegeta were the only saiyans to achieve Super Saiyan level 4! After Vegeta and Goku went this stage, the series and episodes basically end! 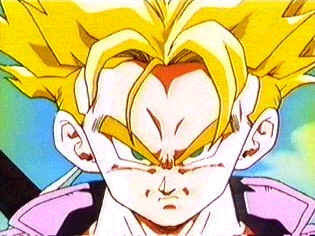 Gogeta, the fusion of Goku and Vegeta, was also able to achieve this level, but had red hair on his head.